Also available in a 10 Count Pack option, in 1oz/45 Caliber and also in 10oz/50 Caliber Bullet Replica Sizes. Hunters, firearm hobbyists, and Second Amendment supporters are guaranteed to take a second look at our NEW .308 Caliber Silver Bullet Replicas. They look just like the real thing and could be just THE gift you have been waiting to give all year! Custom minted at our own SilverTowne Mint in Winchester, Indiana, these pure .999 fine silver bullets are modeled after .308 caliber ammunition that is housed in the formidable Winchester Hunting Rifle. American-made and comprised of 2 Troy Ounces of silver, this strategically designed replica bears the purity and weight, “2oz 999 AG”, on the base (primer area) as well as our SilverTowne pickaxe logo standing in as a mint mark. 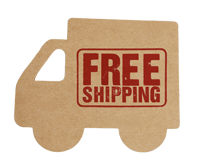 With our in-house designed packaging, your 2oz silver bullet will arrive in a custom fitted foam insert set in a SilverTowne gift box made of recycled material. 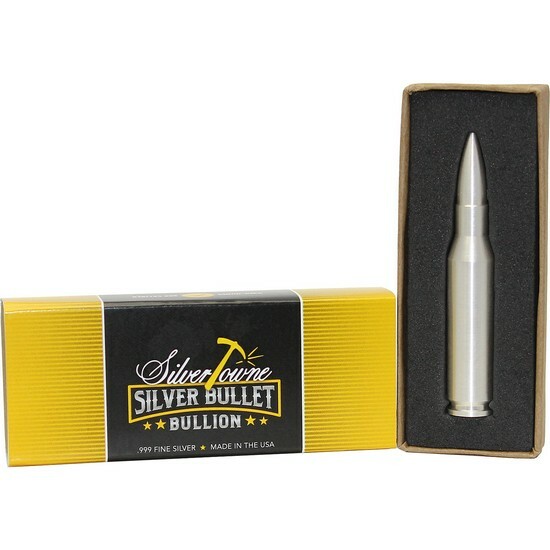 To top it all off, our packaging includes a finished outer sleeve representing our branded “SilverTowne Silver Bullet Bullion” designation while acting as a dual Certificate of Authenticity featuring “.999 Fine Silver”, “Two-Ounce”, “308 Caliber”, and “Made in the USA.” Also included is a customizable blank box area where personalization is key when gift giving is in play.No gift wrapping or gift tags needed! The inspiration for this unique bullion investment is the popular rifle ammunition, the .308 Winchester rifle cartridge. This ammunition was first introduced in 1952, two years before NATO adopted a bullet of similar dimensions. It is the most popular short-action big-game hunting cartridge in the world. These weigh in at 2 Troy Ounces of .999 Fine Silver Bullion. Not intended for use as an actual bullet to be fired from a weapon.